Hakim al Umma Mawlana Asharf Ali Thanwi (Allah have mercy on him) enumerates the different types of stuggles (mujahida) encountered in tasawwuf. “Jihad bin Nafas. That is, to purify it by fulfilling the rights of one’s own self and abandoning the (extravagant & sinful) pleasures. 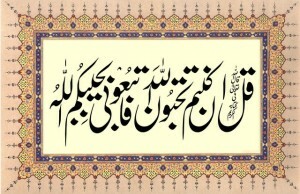 Jihad e qalb. That is to cleanse the qalb/heart (of all impurities and whatever that is other than Him] and detach it form all the attachments of both the worlds (i.e. here & hereafter). This entry was posted in A. Reality of Tasawwuf, B. Praise worthy morals, C. Blame worthy Morals on September 18, 2006 by 'abd.